I'm not normally a big fan of anything labeled 'fluff'. I don't like congealed salads or salads with fruit and marshmallows and such. But I had this recently at a potluck and fell in love. So much, that I had to make it at home, too. It's got that whole salty/sweet thing going on in the most excellent way. Mix together crust ingredients and press into 9x13 inch pan, bake at 400* for 7 minutes. Whip cream cheese and sugar until smooth. Fold in Cool Whip and pineapple. Layer on top of (cooled) pretzel crust, and refrigerate. 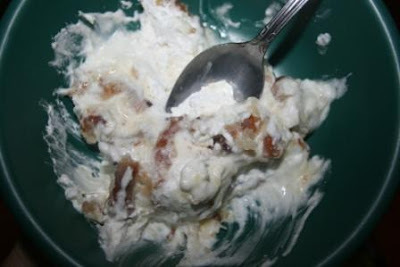 I used reduced fat cream cheese on this and fat free Cool Whip, and it turned out great. Enjoy! I really need to get back to cooking more, I've been so lazy lately.. and also my husband cooks better than me :D But I'd make some really tasty salads, I have to check recipes.. Sounds yummy!! I make a similar one and it is good too. Being southern, I grew up eating congelaed salads and anything with cream cheese in it sounds good to me! I am not usually a "fluff" fan either, but this does sound good. This sounds wonderful! I love pretzels. Ooh, that does sound yummy! You had me at cream cheese! Looks delicious! And easy to make, too. Thanks! I believe I've had something similar at potlucks a few times and I loved it too! Oh my gosh, I have GOT to make some of that. Looks and sounds so good. I don't usually like "fluff" either, but sweet and salty is an irresistible combination. Hi Lisa, That dish looks awesome. I too would use the low-fat or no-fat ingredients --and I'd use splenda instead of sugar. Thanks for the recipe. I may just have to try that little dish... THANKS! Divine! It does kind of look like the food of angels! I bet the boys loved it. I do love the whole salty/sweet thing. Sounds yummy! Oh, yum. I love the salty/sweet combination. This looks delish! This sounds so easy and deliscious! Oh. My. Gosh. This sounds great! This is some of my favorite stuff! This sounds so refreshing! Thanks for the recipe. I will have to try this with my family and see if it goes over. It sounds good but different. Anything with cream cheese has got to be worth a try.